Question: What happens when nearly everyone in THREE* fields shares the same political orthodoxy, and those three fields enjoy nearly complete control over the path** of the culture, and culture and the psyche make each other up***? * Education, news, entertainment (music, movies, television). ** As in the concept of shaping the path in Switch: How to Change Things When Change Is Hard , and as in Haidt’s concept of business ethics: rather than trying to change or convince the person or group, change the environment in which they exist such that it elicits the desired behaviors; tend the social garden so it grows organically from the bottom up rather than try to make its plants grow by yanking them from the top via social engineering. Answer: Mann and Ornstein were right that It’s Even Worse Than It Looks: How the American Constitutional System Collided with the New Politics of Extremism , but by aiming their vector of blame at the political right they’ve aimed it in the exact wrong direction. In a very real sense they help to illustrate my point. I know it’s more than a bit unfair of me to needle you like this. I know a person or an organization has to pick their fights, and the fights you’ve picked are Mount Everest size challenges, AND you’re on my side (more like I’m on your side; you’re the thought leaders, not me, but I trust you get my point). I also know that people can’t hear something until they’re ready to hear it; “tuned up,” as Jon might say, or “start where the client is” as Liz might say. The two of you are gradually enlarging the size of the envelope of what people are ready to hear, and even so you’re at the hairy edge of it, and as such sometimes subject to strong, if not severe, backlash. Both of you are heroes in my book. Without being too self congratulatory, I feel as though I’m outside the edge, ahead of the curve. You, Jon and Liz, are the only people I’m aware of who are “tuned up” enough to even give my ideas the time of day. Well, belay that. Forefare Davis has also been quite kind in his responses to my ideas. I appreciate your presence in the intellectual universe maybe more than you realize. Not just in terms of academic discussions, but also in terms of human connection. I’m not saying you and I are about to go pick out curtains together, I only mean it’s nice that there’s somebody out there who hears me and doesn’t respond to my ideas as if I need to be committed; something that is quite common for conservatives in this culture (talk about microaggressions!!). And finally, I recognize that you actually are doing the sort of mythbusting, described below, that I seek. Your work on How Capitalism Changes Conscience, for example, and your Youtube lecture of Questions for a Resilient Future: Culture, Conscience, & Capitalism do exactly that. The lecture, in particular, is awesome. It drops more than one bomb down the ventilation shaft of the Death Star of the myth-based world view. It’s just terrific. …brings with it a concurrent move toward the small minded, short sighted, feelings-based, thinking – the comforting delusions and the epistemic arrogance – of the current snowflake generation and it’s well-intentioned fixations on trigger warnings, cultural appropriation, safe spaces, and Orwellian thought control that abandon evidence-based reasoning for the feel-good fantasy of the unconstrained vision and John Lennon’s “Imagine” that is ultimately destructive to the emotional well being, and by extension to the policies, mores, values, and priorities, of entire generations. Which brings me back to my response to Haidt’s admonition. 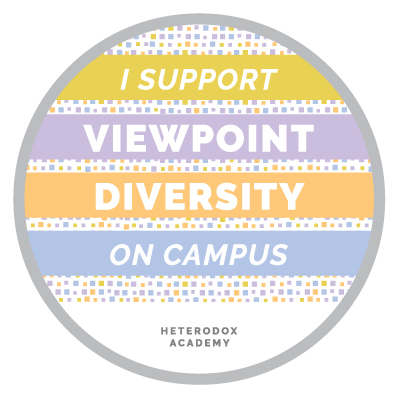 I understand that a conservative presence of some relatively small percentage in any field is enough to create the sort of viewpoint diversity sought by Heterodox Academy. But we’re light years from there. For example, I take Haidt’s silence on the fields of education and entertainment in his admonition to me about conservative news as concession to my claims on those fronts. As for conservative news, it’s a lawn sprinkler against the Niagara Falls of ABC, CBS, NBC, CNN, PBS, NPR, MSNBC, the majority of local TV News stations in the country, the Boston Globe, NY Times, Philadelphia Inquirer, Washington Post, LA Times, San Francisco Chronicle, Chicago Tribune, etc., etc., etc. In the face of the Niagara-like deluge of liberal media, conservative news is more often treated as a pariah – an “extremist” outlier, a cabal of whack-job conspiracy theorist and nuts who “cling to their guns and their religion” – than it is taken seriously. One tiny example: I couple of years ago I went to a performance of the comedy group The Capitol Steps at Walt Whitman High School in Bethesda, Maryland, deep in the heart of hearts of one of Charles Murray’s super zips. The mere mention of Fox News in one of their routines elicited boos, hisses, and catcalls from the supposedly “enlightened” liberal elite audience. The minor presence of conservative news is nowhere near enough of an influence to even begin correcting the “entrenched yet questionable orthodoxies” that are far greater in number than the ones listed on Heterodox Academy’s “Problem” page. False orthodoxies, dogma, exist not just in the misunderstanding of things like psychology, ideology, religion, the role of reason, rationalism, and the others listed at the bottom of this post. They also exist in the misunderstanding of history; of reality itself. The big switch of racists from the Democratic Party to the Republican Party didn’t happen. The southern strategy didn’t happen. Republicans have ALWAYS been more instrumental in the advancement of civil rights than democrats. Does that last one rankle? Did you feel a negative flash of affect? If so then my point is demonstrated. None of those statements are right wing spin. All of them are matter of public record. But that record is kept hidden, like the crazy aunt in the family, well away from the public eye, because it does not comport with the “comforting delusions” of the toxic mix of the sacred value of WEIRD cognition and the many sacred values of the one foundation dogma that is the current path of our culture. The problems identified by heterodox academy extend far beyond social science and even academia. They are pervasive throughout all of western culture, they are the air we all breathe, and they are insidious. Liberalism and conservatism do battle in liberal air, on liberal ground, with liberal rules of engagement. Improving viewpoint diversity without correcting the false dogma of current mythology is like quitting smoking without correcting the cancer. The op-ed below offers but a tiny glimpse of of the wider problem. It describes not just the national media, but Western culture itself. Milwaukee erupts in riots that injure police officers, but it barely becomes national news. Louisiana is devastated by floods, but it takes a week for the national press to notice. The number of fatal overdoses has exploded since 2010. The suicide rate has increased by 2 percent per year since 2006, and hit the highest levels in nearly 30 years last year. If you view the national news media, based in New York, Washington, Los Angeles and a handful of other cities, as way too monolithic in its political views and driven by conscious and subconscious agendas, the half-hearted-at-best interest in these stories isn’t that hard to explain. These stories aren’t easily used to advance the narrative that Republicans are bad and Democrats are good. If a terrible natural disaster in Louisiana can be blamed on a Republican president, then it’s one of the biggest stories of the decade. If the lack of a public statement on a Louisiana disaster during a presidential vacation might reflect badly on a Democratic president, it’s best to treat the flood as a “page A4″ story, check-the-box journalism. A paranoid schizophrenic shooting a Democratic Congresswoman in Tuscon warrants national conversation on whether the Tea Party’s rhetoric is inherently inciting to violence, and whether gun owners as a whole represent some threat to their fellow citizens. But an illegal immigrant shooting a young woman in San Francisco offers no further explanation or discussion, no need for a national conversation on whether a “sanctuary city” might protect dangerous criminals. A racist madman shooting up a Charleston church group indicts all Southerners, but the twisted cruelty of Philadelphia abortionist Kermit Gosnell is just a “local crime story.” If there really is a giant and widening cultural gap between America’s elites and the rest of the citizenry in “flyover country,” how much of it is driven by narrative-minded journalism? If you die in a particular way that can advance the Democrats’ legislative agenda, your death is going to be an enormously big deal. If the circumstances of your death are politically inconvenient to the Left – Brian Terry or the Benghazi four or those who died on the waiting list for the VA — there are no greater lessons to be learned or need for further action; it’s just an unfortunate set of circumstances. One set of citizens are in the picture; one set of citizens on the periphery get cropped out. It just doesn’t fit the picture that someone wants to create.